Some years ago, Gabriela Wagener-Klein, a practitioner in Nuremburg, told me that German doctors and naturopaths were getting excellent results — in ten days or less — with an Indian herb, Boswellia serrata, in the treatment of brain tumors. 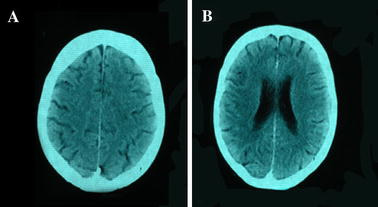 I have been cautiously passing on this information “for what it is worth,” knowing that people with such tumors suffer serious changes in function due to the pressure on the brain, a problem that is usually aggravated by edema. 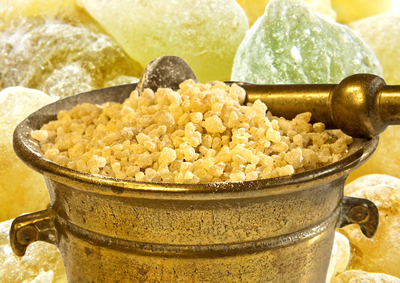 Boswellia serrata is a type of frankincense, one of the gifts brought by the Wise Men to celebrate the birth of Jesus. The frankincense used in the West is usually Boswellia carteri, a Somalian species whose properties have not been studied nearly as much as one might think given the Biblical references. At the Bioneers Conference (in 2000), a man told me that his father has eight tumors. He wanted to know if there is anything at all that would help his father. He went on to do some internet research and to hire someone to translate some of the German language material. Gabriela’s report is evidently well supported by research in Europe. Prof. Thomas Simmet has researched Boswellia serrata on astrocytomes, a tumor noted for its propensity to metastasize. Prof. Simmet’s background is in pharmacology, and he suggests that the boswellic acids reduce inflammation. I was familiar with this research because boswellia is used extensively in Ayurveda to reduce the symptoms of arthritis. Prof. Simmet proposes that boswellia inhibits the production of an enzyme that causes the leukotriene production associated with inflammation. In laboratory tests, Prof. Simmet observed that the more malignant the tumor, the more leukotrienes it produces. This seems to perpetuate a cycle of almost unstoppable growth. 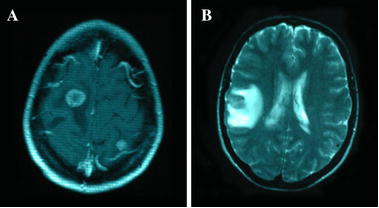 Working with a neurosurgeon, Michael Winking, 25 patients were administered a dry extract of boswellia for one week. The tumors were then surgically removed. About half the patients had such significant regressions that the tumors had all but disappeared. They used a dosage of 800 mg. three times a day. At the university hospitals of Bochum and Giessen, patients with gliome tumors were administered somewhat higher dosages of Boswellia serrata, 3600 mg. per day. Within only a few days, many symptoms associated with brain tumors, such as headaches and lameness, were greatly lessened. 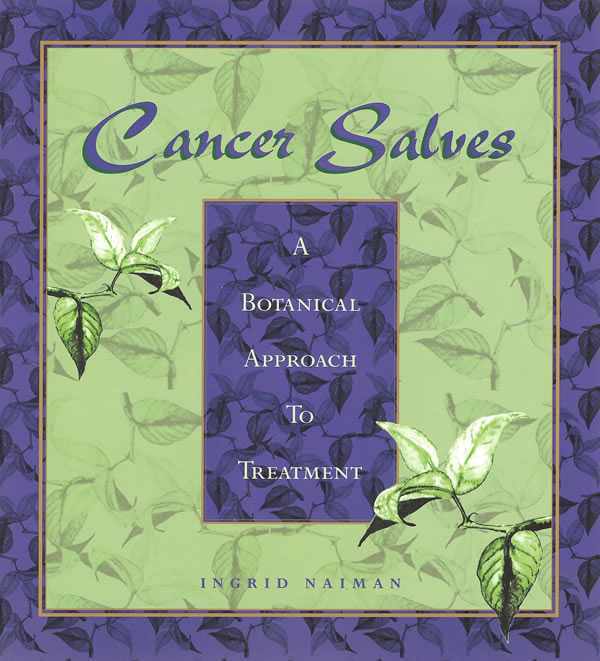 While much of this effect might be more related to the reduction in edema than to the regression of the tumor, swelling and the resultant pressures are serious side effects of malignancy that impact the quality of life. The reports of these trials are preliminary and researchers are unwilling to speculate as to the long-term results and whether or not tumor growth is arrested. I have long been familiar with Boswellia carteri and more recently Boswellia frereana came into my life. Both are lovely and can be used to make incense. 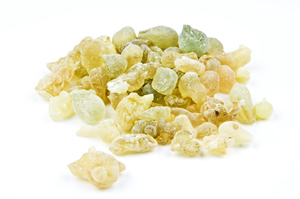 All the different varieties of frankincense have a wonderful aroma and spiritual quality, but Boswellia serrata is more subtle than the frankincense used ceremonially in the West. Boswellia serrata is also very aromatic, but the difference is something like jasmine and stephanotis. Jasmine is powerful and grabs attention whereas stephanotis wafts more delicately and lingers elegantly on the senses. Soon after hearing about Boswellia serrata and the research conducted in Germany, I decided to experiment on a dental abscess that suddenly flared up. I therefore took some capsules; the following day, the inflammation was about half what it was before taking the Boswellia serrata. Boswellia serrata has been considered an alternative to NSAIDs for some time, but more recent research is placing more emphasis on the brain, suggesting that boswellia increases the length of neurons, reduces edema, improves cognitive function, especially of spatial perceptions, and moderately improves mood. The oleo gum-resins contain 30-60% resin, 5-10% essential oils, which are soluble in the organic solvents, and the rest is made up of polysaccharides. The resinous part of Boswellia serrata possesses monoterpenes, diterpenes, triterpenes, tetracyclic triterpenic acids and four major pentacyclic triterpenic acids i.e. β-boswellic acid, acetyl-β-boswellic acid, 11-keto-β-boswellic acid and acetyl-11-keto-β-boswellic acid, responsible for inhibition of pro-inflammatory enzymes. Out of these four boswellic acids, acetyl-11-keto-β-boswellic acid is the most potent inhibitor of 5-lipoxygenase, an enzyme responsible for inflammation. In Ayurvedic medicine, shallaki is mainly used to reduce joint pain. Its action is swift because the molecules cannot be stopped so the overall action includes penetrating and breaking up congestion (kapha), easing inflammation (pitta), and restoring flexibility (vata). Boswellia is said to be beloved by elephants. There is a theory that the larger the animal, the more cells the animal would have. The more cells there are, the more risk there is of a mutation, but elephants rarely develop cancer. So, it is suspected that something in the elephant diet or life style protects them. In the Arab world, frankincense is used as a parasiticide. It is added tto the water that is kept in urns for drinking. This was a very helpful piece of information shared by a distiller from that part of the world. It makes perfect sense that some of the action of the various types of boswellia involves elimination of parasites. Though the behavior of parasites differs somewhat, all are in need of moisture and thus tend to navigate to where they can enjoy synovial fluids. The observations of health professionals, even those from two thousand years ago, may be correct but the precise explanation for the reduction in symptoms was perhaps not known. This said, since my first introduction to this amazing resin, it has been on my radar. I have seen blood parasites disappear in less than 24 hours, equilibrium restored to brain cancer patients in one-to-two days, followed by improvements in cognition and speech in three days, and, well, this is a very convincing herb. In the German-speaking world, most health care professionals are very much aware of Boswellia serrata. It is readily available in capsule form and usually has some turmeric and ginger or galangal added. Within the Ayurvedic world, the use of boswellia for brain tumors and other types of cancer is catching on rather slowly, but there is more and more research supporting its use. 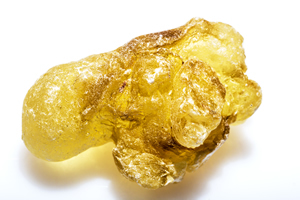 Boswellia resin is harvested by making small incisions in the bark. The tree produces a milky sap to heal the wound and this is captured as a tear. During the dry season, tree resin can be collected every 3-4 weeks. The yield varies according to moisture and temperature, but the is not destroyed when caution is used and the tree is allowed to recover before more resin is sought. In theory there are no adverse effects when taking boswellia at the recommended dose. However, my experience is that prolonged use is not necessary. Since many people are taking the essential oil rather than the powder or extract, use should be limited to the equivalent of one drop per day. This can be added to water or fruit juice and sipped throughout the day. The oil can also be added to shampoo and conditioners, one drop per 45 ml. (1.5 ounces).